There are 24 KIDTALK questions! Players move around the KIDTALK WITH MOM game and share their thoughts. Questions must be answered in complete sentences. The KIDTALK questions are open-ended questions. 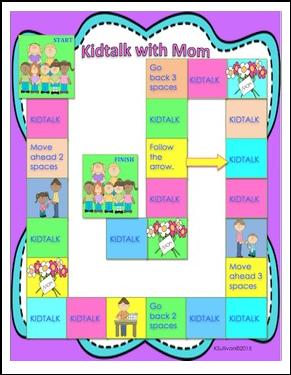 This is a fun game to share with Mom, or to use as a center. One student will have to be Mom. This game is a fun way for students to get to know one another or spend some quality time with Mom. Cards can be read to younger children. Thanks for visiting my store and browse around for more spring freebies! Thanks for downloading and feedback is always appreciated.